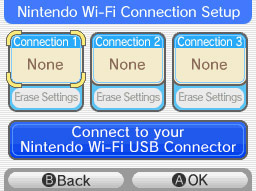 Routers with AOSS are able to automatically detect the Nintendo DS and reconfigure the settings for both to establish a connection with each other. Routers with this feature will have a button on the router identified with the letters 'AOSS'. If you are not sure if your router is AOSS capable, please refer to your router's manual. 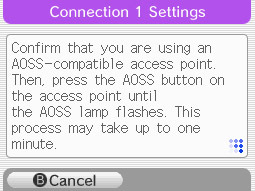 Important - If you already have other wireless devices configured to use your AOSS access point, you may have to reconfigure them after setting up the Nintendo DS to connect to it. If you feel this may be the case, we recommend using the 'Auto Search' function of the Nintendo DS. Routers with the proprietary AOSS (Air Station One-Touch Secure System) security option automatically detect and configure other AOSS-enabled wireless devices. 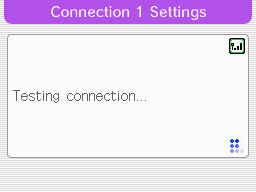 (Most routers do not have the AOSS feature.) 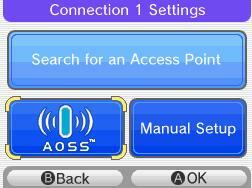 You can determine if your router has AOSS capability by looking for the "AOSS" button. Review the documentation for your router to verify if it is AOSS capable. To connect through the "AOSS" option, follow these steps. 1. 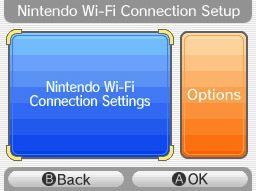 Look for the Setup Utility programme that is included in all Nintendo WFC compatible Nintendo DS games. This utility programme configures the Nintendo DS to communicate with a wireless access point. The information is then saved in the memory of the Nintendo DS. Refer to the specific instruction booklet for the Nintendo WFC compatible game you are playing to find out how to access the Setup Utility. Setup may be different in each game. 3. Setup includes three save files to store settings for play at different locations. Tap one of the files that is numbered "1", "2", or "3". 5. A message will ask you to confirm that you have an AOSS-compatible router. 6. Find and press the AOSS button on your router (this is usually on the back of the router). Consult the user guide for the router you own if you cannot find the button. It may take one to two minutes to complete the connection. You will receive a confirmation message if the test is successful. AOSS and AOSS logo are trademarks of BUFFALO INC. in Japan and other countries worldwide.